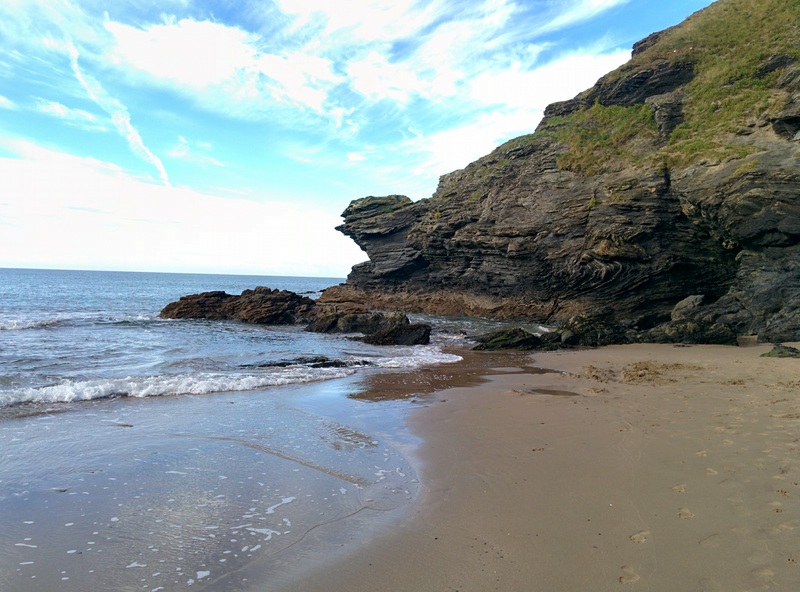 I’ve been practising walking “meditation” on the beach at Llangranog. I begin with my awareness, in my personal here & now. Staying in awareness of myself, my physical presence and senses, I become aware what is around. The experience is as though I’ve opened my eyes & ears further, more gets in, and what arrives is less “filtered”, without judgement. The experience reminds of me of John O’Donohue: “When we walk on the earth with reverence, beauty will decide to trust us”. Is this reverence? Is beauty deciding to trust me? (The “meditation” practice is my own creation, distilled from different things I’ve been taught over many years. I don’t suppose it’s original. It is original to me). I’ve been having a rich and full year, the most full of my life. It’s been filled with love and grief, with listening and learning. I’ve been thinking a lot, I’ve made some sense of my experience and come to a conclusion I can’t escape: it’s good to embrace grief and heartbreak. Perhaps that sounds masochistic or just plain nuts. Allow me to explain. The experience began in November 2015. I went to listen to Stephen Jenkinson speak, not far from my home in Wales. At the end of the day, I shook Stephen’s hand and thanked him for ruining my life, for shaking me up so much when I thought I was approaching an age for settling down a bit. What I particularly took from that day was the thought that the more I embrace the inevitability of my death and the death of my loved ones, the more I will be able to love life. It fits well with Francis Weller’s First Gate of Grief: Everything You Love, You Lose. It might be possible to avoid grief by loving nothing & no one. Which sounds like a recipe for a bleak life of depression & despair. Or we can love wholeheartedly, and embrace the inevitability of losing those we love, right up until our own life slips away. This all became a lot more real only a month later when my dear friend and housemate LJ was diagnosed with terminal cancer. Being beside my friend in her dying time was a sad, painful, joyous and precious experience, the most precious time of my life. I surprised myself by showing up in a way that was a rejection of what I had been brought up with. Coming from a dull, middle class English family who shun strong emotion, my upbringing told me to keep some emotional distance between myself and my dying friend. Instead, I chose the opposite, I chose to lean in to the experience, to lean into love knowing I was also choosing heartbreak. And by the middle of January, when LJ returned from her last holiday, I knew my love had grown, that I really had chosen the way of love & grief. LJ died on Good Friday 2016, at the home we shared, in her own bed with two friends beside her, and me in the next room (we had agreed only two of us at a time with LJ — she didn’t enjoy more people). I her final days, she received wonderful care from friends, her doctor, Paul Sartori Foundation “Hospice at Home” & the district nurses. The evening before, and only a few hours before she fell into unconsciousness, LJ & I connected in a way that is unique for me. I didn’t intend or plan this. I went to sit with her for a while. Knowing she enjoyed company and didn’t enjoy hearing people speak, I chose to sit silently and try to remain present to my friend. What happened next was so far outside my experience, it took a while to make sense of it. We spent about two hours in deep, radically trusting connection, and I experienced something which I will call “love without attachment”. The experience of these two hours are the most precious of my life so far. I am sure my friend died knowing she was loved. I wept easily in the days after LJ died. I got more deeply in touch with my grief a few weeks later with friends while I was in Mallorca. Here, I found all of it, and I howled like a wounded animal. I beautiful, precious and painful experience. Grief, someone said, is a way of loving. So in the first few months of 2016, the deepest connection, gentlest love and the deepest grief I have experienced. Not a coincidence, I’m sure. We can’t selectively numb ourselves — our deepest joy is only as deep as our deepest grief. We can have neither or both. My suggestion? Show up wholeheartedly for all of it: love, joy, grief and heartbreak. Yes, it’ll hurt sometimes. And the love might be exquisite. We are, Sartre told us, doomed to be free. “Essence precedes existence”, which is to say there is no essence of human calling us to be human. No other animal has such freedom. If a wolf ignored the essence of wolf and tried to live as a haddock, he would soon die. A haddock trying to live even as a different fish would be doomed. But we humans have a huge range of choices on how to live. Anyone who finds freedom on this scale unbearable has an easy way out: just sign up for the voluntary slavery offered by any religion. Hand your unwanted freedom the men in funny hats (and it nearly always is a man). With unanswerable questions, I can see two obvious choices but I’m going to recommend the third. The obvious choice with difficult questions is to rely on the men in funny hats again, a popular option for religious people. Not only can they be relied upon to answer the unanswerable, many will even insist on obviously incorrect answers and perhaps stone you to death if you disagree. The second option, typically chosen by atheists, is to ignore unanswerable questions, deny they exist or insist asking them is futile and absurd. This may leave some atheists looking rather cold, having intellect but little emotion about them. I’d like to recommend a third option: embrace Mystery, even come to love it. Ask the impossible questions. Embrace the beauty of the questions and embrace the Mystery of not knowing the answers. If you find the knowledge that your questions will never be satisfactorily answered, acknowledge the fear, embrace it and live with it. If you genuinely believe a question to be worth asking and yet unanswerable, is it not wiser to embrace Mystery than to pretend to know the answer? What is love for? I don’t know. Are there different kinds of love, or are they all variations of the same experience? I don’t know. What happens to me after I die? Probably nothing, but I’m not sure. Is there a god? Unlikely, but I can’t be certain. What is the purpose of life? I don’t even know that it has a purpose. Do I have a soul? Probably not, but I can’t be sure. Is there intelligent life on other planets? I don’t know, and if there is, they could be so far away we would never meet them or even know they exist.